Job Is Alive and Well and Being Held At A US Prison. The book of Job is considered one of the most important of the 24 books of the Old Testament. Job was a righteous man who, like the Patriarch Abraham, had his faith in the Lord severely tested and like Abraham he came out of the test having proven that his faith and his love for the Lord are complete and unconditional. Chapter one of the Book of Job describes a man blessed with children, livestock and property and whose belief and love of the Lord is beyond reproach. By the end of the chapter he has lost everything, including his beloved children, yet all he says is: “the Lord giveth and the Lord hath taken away; blessed be the name of the LORD” and the author makes the point that Job refrained from sin and did not blaspheme or curse the Lord. Job’s greatness is not only that he was able withstand all that had befallen him, but that his faith and his love of God remained unshaken. He was remarkable because his faith was unconditional. One may wonder if there might be people like this today? Are there people who can withstand such horrors as Job and still maintain a pure heart and a solid, unconditional belief in the Almighty? Probably not. At least this is what I thought until I began to communicate with Shukri Abu Baker, Ghassan Elashi and Mufid Abdulkader, three of the five men involved in the Holy Land Foundation case, (HLF 5). In a previous piece I brought a segment written by Mufid Abdukader where he describes their transfer from prison at Seagoville, Texas to CMUs, or Communication Management Units, one of the more diabolical inventions of the US Bureau of Prisons, or maybe it was the Justice Department. Here is yet another segment from Mufid’s account. “Before we got on the bus, they checked our files and names and numbers and gave us a lunch bag of meat sandwich with water & crackers. After all inmates were seated, the trip started and we had no idea where we were going but at least we were finally out of Seagoville Detention Center. While on the highway, you see the outside free world for the first time in a long time, you see the billboards and you see the green grass on the sides of the highway & people driving going about their business just like we used to do. After a while, the bus stopped somewhere in Texas and the driver and guards got off the bus to eat lunch. With our black box over our cuffs, we tried to eat our lunch but it was extremely hard. Shukri and I were sitting next to each other and we were helping each other eat our food and drink water. If you happen to need to use the bathroom, then you go to the back of the bus to relief yourself while still handcuffed. That’s why I avoided eating or drinking anything beyond necessities to avoid using the restroom. The trip continued for approx. 4 hours and we finally arrived at another prison in Texarkana Texas. They took us inside the prison where they removed all the chains and handcuffs and gave us some food and then took us to another Special Housing Unit (SHU) (we are special). This one even much worse than the Seagoville SMU. The cells in this SHU are really very very small with three beds on top of each other with only 18 inches of separation between the beds. There is no room to move around. Ghassan and I could not even stand next to each other to pray. We almost can hear each others breathing. We were so tired that we finally went to sleep. It was a night to remember. “Every event in our life has a purpose and every setback its lesson. I have realized that adversity, whether personal, professional, is essential in personal expansion. It brings inner growth and a whole host of rewards. Never regret your past. Rather, embrace it as the teacher that it is. I know that Allah SWT is rewarding my family for what they are going through as well. I am not the only one being rewarded for this suffering, my family is sharing in the rewards. I am not alone in this trip, my family is riding with me every step of the way. They are always in my heart and soul. Their image never leaves my mind. My family is also being deprived as my daughter Sarah told me that there is a big empty space in our house and an eerie feeling because I am not there. She told me that they miss my laughter, hearing my voice, my physical presence when they were used to seeing me walk thru the door. They miss having dinner with me. They miss me helping them with homework. They missed my presence at the milestones events of their lives when they graduated from University and High School. They miss the father they love and the husband who is not there to help and support them. As I was writing this, I shared the story of Job with my kids, and then told them a little about the contents of this piece. Even to them, the association was clear. I am not a believer, but if there is a God out there, I am certain he is proud of these men, these dedicated believers. If there is one thing that is truly frightening it is an army of soldiers who really believe God is on their side. In Israel and in the West people like to believe that Israel is immune to that. That Israel is somehow a secular religious entity and that the rule of law and common sense prevail and will always prevail over the more religious fundamental parts of Israeli society. Well, think again. If this photo, of fundamental Jewish soldiers, swearing in on Mount Masada does not scare you than you are living in total denial. There is a clear an present danger that the Jewish version of Taliban is gaining momentum and gaining power. The the number of fundamentalist religious officers in the IDF is over 30% and growing. As one who believes in the secular democracy I feel this is the biggest threat to both people. Our main concern as Israelis and Palestinians should be the irreversibility of the situation. In other words, that it will become too late to create a real secular democracy because these soldiers of God, who see themselves as the successors of the fringe zealots who tried to bring down the Roman Empire but brought down themselves and the Jewish state instead, will rise to such power that secularism and democracy will no longer have a chance. Israelis, Jews, Palestinians and everyone else who is still stuck in the notion of a Jewish state, take a good look at this photo. Then read the news, travel to Hebron, Kiryat Arba, Karmei Tsur and some of the other Jewish-zealot colonies in the West Bank. Walk around the Jewish Quarter in the Old City of Jerusalem and talk to the settlers who want to turn Silwan into the “City of David.” Talk to these people who see this as a zero sum game and think nothing of killing Palestinian children. The discussion of two states is numbing everyone and this photo should wake up all Israelis and Palestinians. We need to act together for a secular democracy, equal rights and the protection for minorities. My Speech for Palestine Awareness Week at SDSU. I want to read to you a passage from my upcoming book The General’s Son, and I quote: (Growing up we were taught to believe that the Arabs had left Eretz Israel partly on their own and partially at the directive of their so called leaders, and that therefore taking their land and homes was morally OK. It never occurred to us that even if they did leave willingly, we had no right to prohibit their return. But then Israeli historians had found that what Palestinians have been saying for decades was true.) end quote. In other words when Palestinians claim something is true we doubt it but when Israelis claim it themselves, well now that is a different story. So Israeli historians found that Israel and Palestine the exact same place. But when Israel was created it was created on the ruins of Palestine. Now, although Palestine was not a state yet, it would have become one had it not been so thoroughly destroyed. Palestine had bustling cities where commerce and trade were taking place, they had a middle class, they had judges and scholars and a rich political life and indeed they had culture and a unique identity that set them apart from the rest of the Arab world. What the Palestinians did not have, the one thing in which they did not invest was a military. And while they constituted the vast majority of the population, when the Jewish militias attacked, they were helpless. The Jewish community in Palestine at the time was small, numbering less than half a million people but it had developed its own state like institutions separate from those of the Palestinians. Based on the principle of Hafrada, or segregation, they had developed their own schools, a nationalized health care system, a quasi government and a strong, well trained militia with young men like my father who were dedicated to creating a Jewish state in Palestine disregarding the existence of the vast majority of the population who were, Palestinians. In 1948 the Jewish militia became the Israeli army but between the end of 1947 and the beginning of 1949 they destroyed close to 500 towns and villages and exiled close to 800,000 Palestinians who to this day are not permitted to return. So, it turns out that the creation of Israel had not, after all, been a haphazard fight in which the Arabs fled their homes due to the directives of their own leaders. It had been a systematic campaign of ethnic cleansing by the Jewish militia involving massacres, terrorism, and the wholesale looting of an entire nation. My mother remembers the homes of the Palestinians who were forced to leave West Jerusalem. She herself was offered one of those beautiful spacious homes but refused. She could not bear the thought of living in the home of a family that was forced out and now lives in a refugee camp. She said the coffee was still warm on the tables as the soldiers came in and began the looting. She remembers the truckloads of loot, taken by the Israeli soldiers from these homes. After the war was over, the Palestinians who remained within the newly created Jewish state were forced to become citizens of a state that forced itself upon them and they were designated as “The Arabs of Israel” a designation that denies them a national identity and rights. They are Arabs in a Jewish state and they are citizens of a state that is despised by all its neighbors. Another widely accepted Zionist myth is that in 1967 Israel had to defend itself against an existential threat as invading Arab armies were about to wipe it off the face of the earth. And it just so happened that miraculously the Israelis won and conquered lands to the north, east and south defeating three massive armies. Well, setting aside the countless books that have been written in Hebrew, English and Arabic and documentaries that were filmed and disprove this myth, and clearly show that Israel attacked in order to conquer, as part of the research for my book, I sat for days at the Israeli army archives reading through the minutes of the meetings of the Israel army general staff. Here is another quote from my book: (In a stormy meeting of the IDF top brass and the Israeli cabinet that took place on the 2nd of June, 1967, my father General Matti Peled told the cabinet in no uncertain terms that the Egyptians needed at least a year and a half in order to be ready for a full scale war. His point was that the time to strike a devastating blow against the Egyptian army was now, not because of an existential threat but because the Egyptian army is NOT prepared for war. The other generals agreed. But the cabinet was hesitant. The cabinet members and Prime Minister and a tug-of-war of unimaginable proportions ensued. During that same stormy meeting my father said to the Prime Minister: “Nasser (Egyptian President Gamal Abdul Nasser) is advancing an ill prepared army because he is counting on the cabinet being hesitant. He is convinced that we will not strike. Your hesitation is working in his advantage.”) No mention of an existential threat but of an opportunity to assert Israeli strength. Years later this was confirmed by other Generals, including the butcher Ariel Sharon. His words were ignored, his claims brushed aside and instead, blinded by their newly gained access to places with mythical/biblical names like Hebron and Bethlehem, Shilo and Shcem Israeli leaders began a massive settlement project to settle Jews in the newly conquered land. A few years later my father called on Israel to negotiate with the PLO: The Palestinian Liberation Organization (PLO). He claimed that Israel needed to talk with whoever represented the Palestinian people, the people with whom we shared this land. He believed only peace with the Palestinians could ensure our continued existence as a state that was both Jewish and democratic.) Now, all these years later people talk of creating a Palestinian state in the WB but that option no longer exists. The myth of Israel being a democracy is still being perpetuated even in light of overwhelming evidence to the contrary. While Jewish Israelis over there and AIPAC over here like to think they are the only rightful citizens of their land and will argue that they live in a democracy, this is far from being true. Israel has been in control of the West Bank for over four decades and had built and invested heavily in the West Bank. But Palestinians who make up the vast majority of the population in the West Bank are excluded from any of it. In other words, 100% of the construction in the West Bank was done to bring Jews into the WB and exclude the close to 3 million Palestinians whose land this belongs to in the first place. 3 million Palestinians are left out, disenfranchised even as they see their lands taken, their homes destroyed and roads, malls, schools and gated communities being built for Jews only with no access to them or their families. Some democracy. And that is not the worst of it. Water, the scarcest resource of all is controlled and distributed by the Israeli water authority, including the large amounts of water that exists within the WB. 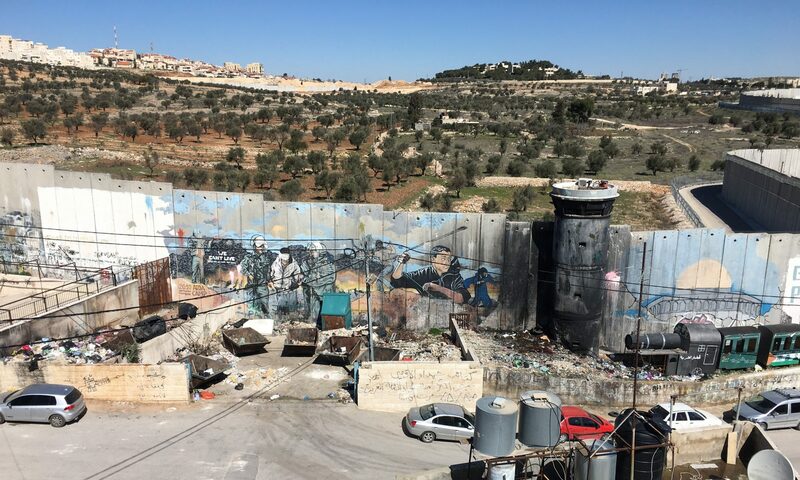 According to Betselem, the Israeli human rights organization the ground water from the Mountain Aquifer is a shared water source for Israeli and Palestinians. It is the largest and highest quality water source in the area, producing 600 million cubic meters (mcm) of water annually. Israel holds almost complete control of the aquifer and exploits 80 percent of the production for its needs, leaving the remainder for the Palestinians’ use. “The discriminatory and unfair division of shared water resources creates a chronic water shortage in the West Bank, and is liable to harm Palestinians’ health.” The World Health Organization recommends a minimal per capita daily consumption of 100 liters. The daily per capita consumption in Israel is 242 liters, the consumption in the West Bank is 73 liters per person. “In certain districts, consumption was as low as 37 liters (Tubas District), 44 (Jenin District), and 56 (Hebron District).” So Palestinians have to buy their own water back from Israel, as Israel does not recognize Palestinian rights to the water that exists under Palestinian land. As absurd as it sounds Palestinian farmers are prohibited from digging wells on their own land. When seen as a per year distribution it is even more alarming. Israel distributes the water as follows: Per capita, Israeli Jews receive 300 cubic meters of water per year. Per capita Palestinians receive 85 cubic meters per year. (World Health Organization recommends 100 per year) Per capita, Jewish settlers in the WB are allocated 1500 cubic meters of water per year. In other words while Palestinians have barely enough to drink, Jewish settlers not 500 yards away have swimming pools and green lawns. So does anyone seriously think that this can go on forever? Democracy indeed. Now in light of the peoples uprising in the Middle East we can expect to see dictatorial regimes falling like dominos. Can we expect that 5 million Palestinians will continue to live under a regime, that is democratic for Jews but is a brutally oppressive one to Palestinians? There are close to 6 million Israel Jews and 5.5 million Palestinians sharing the same country under different laws. My father’s predictions have all come true. The work of the Israel lobby in this country not withstanding, people around the world are beginning to realize that there are in fact two nations who live between the Jordan River and the Med sea and that the brutal regime under which Palestinians live is unacceptable. And speaking of AIPAC, I remember seeing many of you, the mighty San Diego AIPAC bunch who are sitting here tonight, at the vigil that was held for the innocent victims murdered by Israel in Gaza. It was held a couple of months ago in Balboa Park. You were draped in the Israeli flag, singing and dancing as we who were there too, separated from you by a line of police and a sense of morality tried to recall the names of over 1400 dead, innocent civilians, police officers, children, women and men who were killed by the state of Israel in a matter of three weeks. Those were three weeks of such death and destruction that one can hardly comprehend. I recall stories of the Israeli air force pilots who flew sortie after sortie, dumping hundreds of tons of bombs on Gaza, exposing a civilian population to unimaginable horror and then returning home to their families to celebrate the Jewish holiday of Hanukah, you see the attacks took place during Hanukah. Then these pilots, having enjoyed the celebration slept well in the comfort of their homes and their beds only to get up the next morning and do it again, and again, and again. I recall that during the vigil you who were draped in the Israeli flag held signs that told of the warning the Israeli army gave the people of Gaza prior to the attacks. They dropped thousands of leaflets to let the besieged people of Gaza know that this nightmare was about to begin. I can only imagine the mother who saw the warnings. Knowing that the death and destruction were pending and knowing also that there was no where to go, nowhere to take her children no where to hide them from the fire, the smoke, the chemicals and the phosphorous that melts the flesh and won’t be extinguished – no where to go because Israel had imposed a siege, a never ending lockdown on the people of Gaza. So for the Israeli air force pilots, young men who Israelis and Jewish Zionists everywhere consider their finest, this was nothing more than shooting fish in a barrel as they began their merciless onslaught at precisely 11:25 am on December 27, 2008. A date that will forever be etched in our memory as one of the darkest and most shameful days in the long history of the Jewish people. A day when the Jewish State committed horrendous shameful crimes by dropping hundreds of tons of bombes at the precise time that Gaza children were out on the street. Between 11 and 11:30 AM 800,000 children of Gaza are on their way to school or returning home from school, it is at this time that the two shifts of the school day change. That was the time chosen by the Israeli decision makers to begin the assault. To emphasize the how criminal this is, I want to read to you the quote from Charles Glass a veteran writer and middle east reporter: In “The Tribes Triumphant” arguably the one of the best books ever written about the Middle East, journalist Charles Glass describes children in Gaza on their way to school in the morning. Everyone should read his book, by the way, and here is what he writes about children in Gaza: “..in smocks of blue or grey little girls with white fringe collars, boys leading their younger brothers…with canvas bags of books on their backs, hair brushed back and faces scrubbed .. Thousands and thousands of children’s feet padding the dusty paths between their mother’s front doors and their schools…Gaza is a children’s land. …beautiful youngsters so innocent that they could laugh even in Gaza.” these are the people Israel attacked on that dark, dark December day. Those of you who are here because you support Israeli brutality will no doubt claim that Israeli had the right to act as it did because it was acting in self-defense. Self defense from kassam rockets fired by Hammas militants in Gaza. Thousands of rockets that were launched to kill innocent civilians in Israel. I know a thing or two about kassam rockets. I was sitting with my children and relatives in a kibbutz, a stones throw from Gaza relaxing on a Saturday afternoon as the rockets began flying over us and the alarms went off. It was frightening. Just this last December a kassam rocket fell in the same kibbutz near the kindergarten, when children were present. The children were hurt. There were bloody scratches, shattered glass everywhere and several children were hospitalized in a state of shock. I saw the hole in the ground created by the rocket, the size of a large soccer ball. And then I remembered what a crater made by a one-ton bomb looks like. It is the size of a city block. Children do not suffer shock or scratches, they are decimated and burned and buried in the rubble and suffocated from the fumes. Now, multiply that by 100 and multiply that again and again and keep in mind that in Gaza population density is one of the highest in the world 10k per sq mile. Yet the Israeli lobby will justify this. Those among you who are Jewish will be familiar with the story in the book of Genesis, chapter 18, verses 23-26: God decides to destroy the city of Sodom and Abraham, the patriarch chastises him and says “wilt thou also destroy the righteous with the wicked, perhaps there be fifty righteous within the city” and God promises he will spare the city if he finds 50 righteous people. But in Israel today there is no Abraham, for as we know there are 800,000 children in Gaza and Israel did not spare them the horror. Hard to imagine. It seemed impossible to carry on. But my mother always said that life was stronger than death. And so we went on. But something had changed. I felt I had to do something and I knew that meeting and talking to Palestinians was the right thing to do. And so I did, and I began right here in San Diego where I was welcomed by the warm embrace of the local Palestinian community. The experience of meeting Palestinian was comforting, liberating and heart wrenchingly difficult. It was comforting because I found that we were very similar, it was liberating because I found we are not doomed to be enemies forever and it was heart wrenching because I realized I did not have full possession of the truth – that is where you my AIPAC supporting friends are right now: you are not in full possession of the truth and I suggest you get over it and join me in what was so eloquently described by the great Clovis Maqsoud as The “Constituency of Conscience”. I can only imagine that the whites in SA upon seeing the end of apartheid wanted so badly to hang on to their dying way of life, corrupt as it was. I can only imagine that white racists in the Southern states were doing the same as legalized racism and discrimination came to an end in this country. We see brutal tyrants everywhere these days, from Libya to the Gulf states do the same. Holding on even as they fall one by one. Now Zionists and their supporters do the same, holding on to the notion that a racist regime can last, that injustice and horror can last that crimes against others who are different can go unpunished. But we are near the end. The Zionist dream of an ethnically, religiously homogenous state was shattered by the Zionists themselves with their insatiable hunger for land. In their own hands they created a bi national state, a state where half the population is not Jewish or Israeli but Palestinian Arab. True they have no rights, true also that they are not counted but that will change and sooner than you think. Change will come because the non-violent resistance movement in towns and villages all over Palestine will prevail. In Beit-Umar, In Bil’in, in Nabi Saleh, in Silwan in Ni’ilin, in Shekh Jerrakh, in Maasara, dear friends Palestinians and Israelis who are committed to justice and democracy, organize non-violent marches every single week. And this is why we who believe in justice and democracy are optimistic. The people, grass roots Palestinian leaders who are dedicated and relentless. In East Jerusalem, just outside the walled old city and not far from the Jewish Quarter, sits the neighborhood of Silwan with close to 50,000 residents. Israel wants to expel families from Silwan in order to build an archeological park that glorifies its Jewish past. They claim that king David built a city there some 3000 years ago and they hope to find the remnants of this city under the homes of the people of Silwan. Thousands of families may have to leave so that Israel can build a park to glorify a conquest that took place 3000 years ago, never mind that not a shred of scientific evidence exists that such a king ever lived, any more than there is evidence the world was created in 6 days. The past trumps the present in Israel – a state that wants to eliminate the existence of people who live on their land to solidify the myth of a glorious past. But the Palestinians constantly and stubbornly interfere with the Zionist myth making and so the Palestinians, men, women, children and the elderly along with their schools and mosques, churches and ancient cemeteries and all evidence of their existence must be destroyed so that Zionist claims to exclusive rights to the land may be substantiated. So, those of you who wish to associate yourself with Zionism and AIPAC and drape yourselves in the Zionist flag, the flag that has come to symbolize intolerance, hate, racism and brutality, feel free to do so. But know this: When the trials begin, when the tribunals take their seat, when the “truth and reconciliation” commission begins its work and when you are finally shamed into admitting that you are wrong, remember to go down on your knees and beg for forgiveness of the people you so blatantly wronged. You will not be able to claim that you “did not know” because we watched you dance as others were counting their dead. Remember and never forget that you and I and these witnesses were here today. Because I will not forget you, they will not forget you and worst of all, your conscience will not let you forget that you draped yourself in the flag, you supported the killing and you mocked the bereaved. The rest of us will move on, and along with the rest of the Middle East we will follow the example of the brave people of Egypt to create what will surely be tremendous accomplishment: A democratic, secular state in our shared homeland, A state where Muslims Christians and Jews live as equals. A shared state, a secular democracy, where every vote counts and people raise their children to love their diverse homeland with its multitude of cultures, its rich history and its promising future. It is true that there is a misguided assumption that sharing the land means nations have to be enemies but that is not true. Israelis and Palestinian will join together in their shared homeland and form something that is greater than the sum of its parts. Thank you very much.